Today, the blogosphere was atwitter with the news that bow-tied super-douche Tucker Carlson, last night on Fox News, declared that "Iran deserves to be annihilated. I think they're lunatics. I think they're evil." 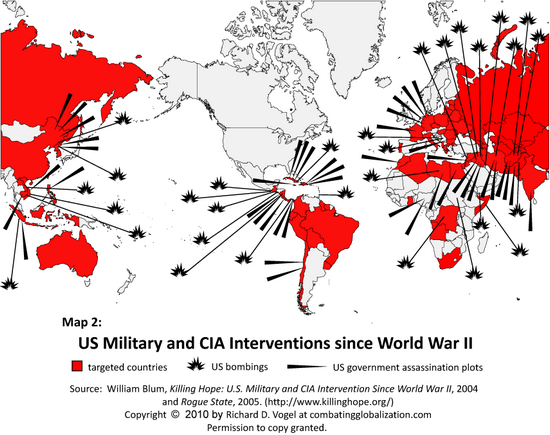 He also, bizarrely, stated that "we are the only country with the moral authority [...] sufficient to do that" because, apparently, the United States, with its more than 1,000 military bases across the globe and penchant for bombing, remote-control murder droning, unaccountable worldwide torture regime, invading and occupying foreign countries, is "the only country that doesn't seek hegemony in the world." 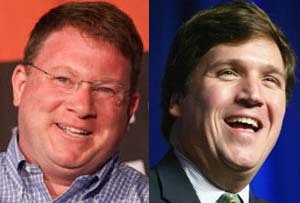 Carlson's call for genocide was revealed to the non-Fox News-watching world by ThinkProgress's intrepid Eli Clifton and was quickly lambasted by numerous commentators. Even Jeffrey Goldberg has weighed in. Goldberg, who has made a career of leading the charge for illegal war and declared back in 2002 that "the coming invasion of Iraq will be remembered as an act of profound morality," didn't much like Carlson's comments. Writing on his blog today, Goldberg - after noting that he is "on friendly terms" with Carlson - condemns Carlson's murderous outburst as "the sort of rhetoric that leads to war" and states that "language like this -- careless or premeditated -- is inhuman and sets back America's interests." This is all very noble and humane of Goldberg, but it's also completely disingenuous and hypocritical. It should go without saying that Iran does not "deserve" to be annihilated. I wish, of course, that Iranian citizens will one day soon be free of the evil regime that rules their lives, and that Iran's neighbors, Arabs, Jews, everyone, will be able to live without fear of Tehran's aggressiveness. Yet, unsurprisingly, Goldberg doesn't even play by his own rules, often using the shorthand term "Iran" to refer to the country's government. In his much-discussed and totally wrong September 2010 blockbuster, "The Point of No Return," Goldberg hysterically referred to "the immediate specter of nuclear-weaponized, theologically driven, eliminationist anti-Semitism," meaning, of course, the Iranian government. Goldberg also described the Iranian government as "an unstable leadership, they are a crazy leadership" and explained, in the most paternal and patronizing manner possible, that "if they give up this path, if they stop seeking nuclear weapons, good things will happen to them." In a totally incoherent rant published last June and amazingly headlined "Iran Wants the Bomb, and It's Well on Its Way," Goldberg decided to discuss "the reality-based worry that bloody-minded mullahs bent on dominating the Middle East aren't the sort of people who should have the bomb." Goldberg also rehashes the baseless allegations that the Fordo enrichment plant was "exposed by Western intelligence agencies in 2009" and that "peaceful, internationally supervised nuclear program presumably would have no need for secret uranium-enrichment facilities buried inside mountains" Not only did Iran itself announce the existence of the site in accordance with its obligations under the safeguards agreement it has with the IAEA, but the site itself is under round-the-clock surveillance and subject to more intrusive inspections than nearly any nuclear site on the planet. Additionally, one might assume that with near daily threats of and rumors about an imminent, unprovoked Israeli or American attack on Iranian nuclear facilities, even sites under safeguard (and in which the IAEA has repeatedly and consistently confirmed - multiple times a year, year after year - that there has been no diversion of nuclear material), should be defended from potential, illegal aggression. For Iran not to staunchly defend facilities and technology (in which it has invested billions) from attack would, in fact, be profoundly irresponsible, negligent, and dangerous. On October 17, 2011, Goldberg described the Iranian government as "chaotic" and the Revolutionary Guard Corps as "protectors of Ayatollah Khomeini's dystopian vision for a radicalized Muslim world, enthusiastic exporters of terrorism, and rulers of a state within a state" and wasted multiple paragraphs on the supposed threat to American warships in the Persian Gulf by "a couple of true believers in an explosive-laden speedboat." The next month, Goldberg wrote a piece for Bloomberg called "Why Obama Might Save Israel From Nuclear Iran." In it, Goldberg claimed that the IAEA "is set to release a report...offering further proof that the Iranian regime is bent on acquiring nuclear weapons." Well, that didn't actually happen. Furthermore, Goldberg once again stated that "[t]he leaders of Iran are eliminationist anti-Semites" and "mystically minded, mesmerized by visions of the apocalypse" and who "have repeatedly called for Israel's destruction and worked to hasten that end" by backing resistance groups which, Goldberg declares, "specialize in the slaughter of innocent Jews." In short, Goldberg sums up, "Iran's leaders are men who deny the Holocaust while promising another." Again, one assumes Goldberg doesn't find his own absurd rhetoric to be "the sort...that leads to war." A few days later, in a blog post with the header "Is an Attack on Iran's Nuclear Program a Bad Idea? ", Goldberg did his phony hand-wringing thing again. "As for me, well, I don't know which one is worse: A preemptive attack, or a nuclear Iran," he opined. "An attack would be disastrous on many levels, but I also think that a nuclear Iran would not be fully containable." On January 23, 2012, Goldberg declared, "It's beyond a doubt that the Iranian regime would like to bring about the destruction of Israel." In the same piece, embarrassingly entitled "How Iran Could Trigger Accidental Armageddon," Goldberg concluded that "opponents of military action make a mistake in arguing that a nuclear Iran is a containable problem. It is not." Reading this determination, one wonders whether Goldberg thinks "[t]his is the sort of rhetoric that leads to war" or not. Iran represents the definitive, post-Nazi Jewish nightmare: a regime that openly argues for the destruction of Israel and is seeking nuclear weapons. The Iranian supreme leader, Ayatollah Ali Khamenei, said just last week, "The Zionist regime is a cancerous tumor that should be removed and will be removed, God willing." The regime seems bent on building weapons that could actually bring about the obliteration of Israel and its six million Jews. Just the other day, Goldberg once again exploited the Holocaust, through around the Nazi analogy and decided that "Iran is run by a regime whose first, defining act was of mass hostage-taking." Anyone with even cursory knowledge of the Iranian Revolution would know that the actual "first, defining act" of the Islamic Republic would better be described as the drafting and adoption of a complex and unique constitution which was approved by popular referendum mere months after toppling the quarter-century tyranny of the U.S.-backed Shah. But for Goldberg and others like him, Iranian history began on November 4, 1979. Goldberg continued to describe Iran as "comprehensively evil" and, more generally, "evil people." So, according to Goldberg, when an Iranian official uses the specific term "regime" (as in, say, "this regime occupying Jerusalem must vanish from the page of time"), he secretly means "every single Jew on planet Earth," but when Goldberg himself uses the term he's really only describing the "crazy" or "evil" or "bloody-minded" or "eliminationist" Iranian government. So, let's see here. Why might Goldberg be frustrated with Tucker Carlson's outlandish verbal diarrhea? Perhaps it's because he's stealing Goldberg's thunder. I'm more disturbed by the fact that you argue again'st Goldberg's label of Iran's government as "evil". While I certainly detest Goldberg and his ilk of war drummers, I couldn't help but pause at your suggestion that "annihilating" the Iranian regime in particular is a bad thing. If you mean "annihilate" in the violent sense, as precipitated by some catastrophic war, then, yes, obviously that's a bad thing. But, just like the Zionist regime in Palestine, the current structure of the Iranian state needs to be thoroughly dismantled and reconstituted so that its citizens may be closer to enjoying equality and liberty. I assume you're inclined to agree with me, but I just say this to point out the fine line between opposing war with a terrible regime and evincing sympathy for it. Oh look! "Anonymous," the guy or girl who can't seem to stop trolling my site, is back and still can't seem to harness enough energy or creativity to come up with a phony pseudonym. Point of fact: I didn't actually argue that Goldberg's description of Iran as "evil" was inaccurate; I stated that it was hypocritical and hopefully implied that I think Goldberg is a Grade-A Jackasshole. To address your contention, though, I will simply note that I find inane, online trolling commentary, coupled with Manichean Weltanschauung, to be the single greatest evil known to all of mankind. I do certainly agree that a distinction can and should be made between opposing war against a country and supporting the government of said country. However, that's not really what we have here. The "annihilation" of Iran (or its leadership/government) - which, I should additionally point out, was never explicitly advocated by Goldberg in those terms - is not a very convincing way to call for a transition from an Islamic Republic to, say, a Parliamentary Republic or Constitutional Republic. Me thinks a popular referendum regarding the legitimacy of the velayat-e faqih was not where Carlson was going with this one. As ever conflating being jewish with zionism. Does the inconvenient fact that the largest jewish population present in the Middle East outside of Palestine reside in Iran - and happily so.